The years after the Second World War were known historically as the period of recovery from the ravages of war; the years for reconstruction and rehabilitation of the remnants of the devastating war; and a time for renewed commitment to education. It was not a pleasant afternoon in early 1946 at the Javier Printing Press for two gentlemen, Mr. Juan Y. Javier and Atty. Jesus Lorenzo A. Arguelles. They had a common gripe against a school owner who failed to pay the cost of the printing of instructional materials and the failure of Atty. Arguelles to collect his salary as a college teacher at the academic institution of the said school owner. By providence, the two men decided to open a school. Their decision of establishing an academic institution could have been due to their grievance against a school owner. But such gripe developed into a desire to open a school for the purpose of catering to the educational needs of the Batangueños, who could not afford the high cost of education in Manila. In order to realize their plan, they invited prominent people who would provide them with the necessary resources for the project. They knew that they needed people with vision, integrity, dedication, credibility, courage, perseverance, and leadership and who have a very high regard to education. Hence, they invited Rev. Fr. Vicente R. Catapang, a noted educator from Taal; Atty. Francisco G. Perez, a senior board member of the Province of Batangas; Mayor Roman L. Perez of Batangas; and Atty. Pablo C. Umali of Lipa to pool their resources to create a possibility to establish an educational institution. Together, they laid the plans for the founding of the Western Philippine Colleges. The Birth of the College and the Start of Operation 1946 was a year of uncertainties for Filipinos who had just experienced the pains and sufferings brought about by the cruelty of war. Filipinos, most specifically the Batangueños, were almost hopeless. After the Spanish colonialism, as well as the American and the Japanese invasions, every individual Filipino was asking whether the wounds of conflict and slavery would already be healed or it would just be reopened by another unknown conflict with another foreign colonizer. For the optimists and the highly-spirited people, the year 1946 was the age of freedom and change. It was, for the hopeful people, a year for reconstruction and rehabilitation. These people believed that it would definitely be a difficult task to rebuild the society. But with a strong desire to serve the people, and with love and commitment, the optimists believed that there would be hope. Such idea was conceived by six ambitious men who were so obsessed with the establishment of an academic institution that would be responsible for reconstructing the society and giving the youth the much needed hope in order to obtain the desired happiness and fulfillment. It was the hope of these brave men to help the youth develop love of country and awaken in them the moral consciousness so that they might be able to face their responsibilities of rebuilding society with added vigor and enthusiasm. Establishing a college after the war was not an easy task. Countless problems had to be solved like school site, facilities, and equipment, funding, human resources, as well as securing the permit to operate from the Bureau of Private Schools. Armed by the spirit of service and love of fellowmen, the six ambitious but noble founders moved with indomitable will to surmount all odds and difficulties. They painstakingly took all the challenges as part of their great struggle because they were aware that since they were aiming for the attainment of a big dream, it would be necessary that they would experience greater challenges. Hence, their sufferings did not become a hindrance in pursuing their dream. were able to establish a bandwagon of sympathizers who looked kindly to their mission. Announcements of the school opening were posted on walls and posts, and advertised in local newspapers and movie houses. This part of the campaign was undertaken by Mr. Arguelles with the help of the other founders. By all these tokens, it was apparent that the popularity of the founders and their cause was well on the threshold of success. On April 28, 1947, the first classes of 48 students formally opened after a year of planning and laying the groundwork for the founding of the Western Philippine Colleges. The first school site was a small rented house opposite the Batangas Trade School, now the Batangas State University. The first courses offered were Education with Mr. Juan Javier as the first Dean, Liberal Arts with Atty. Francisco G. Perez as Dean, and Commerce under Dean Pablo C. Umali. The High School and the Elementary departments were also started with Mrs. Flordeliza M. Arguelles and Ms. Gliceria Martinez as the principals respectively. Due to the sudden increase from 48 to 78 students after a year, the classes were transferred to the Javier house, which was located on the corner of D. Silang and P. Burgos streets, now occupied by the Jollibee Foods Corporation. Rev. Fr. Vicente Catapang was elected by the Board of Trustees as President and overall Administrator because of his wisdom and expertise as an educator. Atty. Arguelles was elected Executive Secretary. Unfortunately, Atty. Arguelles had a massive heart attack followed by his sudden demise in July of 1947. He was replaced by his wife, Mrs. Flordeliza M. Arguelles. Many problems related to unstable finances, resources, and facilities like the library, school ground, and a limited number of teachers cropped up and had to be solved immediately. The needed money had to be borrowed from the founders. The problem as regards the school ground was solved by borrowing a vacant space from the Batangas High School used for military drills and ROTC parade and training. 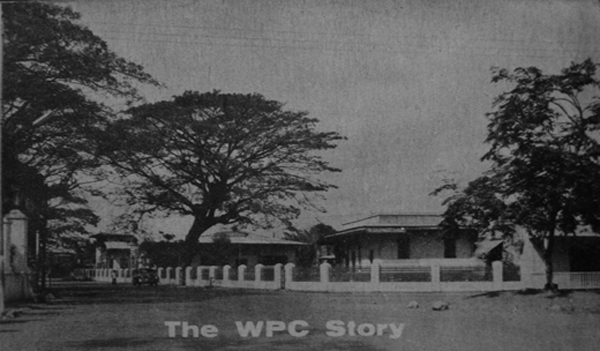 To increase the finances of the college, an educational partnership was forged on December 5, 1947, which marked the beginning of Western Philippine College, Incorporated. New stockholders subscribed shares to augment the existing capital. Despite the grave problems that beset the college, the first graduation program of 14 high school senior students was held on April 30, 1948, with Judge Vicente Arguelles as the guest speaker. Remigio Agpalo was the first valedictorian and Rafael Dimaculangan as the first salutatorian. The growth of the College’s big increase was noted in the number of high school graduates from the initial 14 to 63 in the school year 1948-1949. It was also in the same year that the first batch of college graduates, 18 from the College of Liberal Arts and 48 from the Education and Normal departments were turned out with the Honourable Speaker Jose P. Laurel as commencement speaker. In June of 1949, the College of Law was opened with the Honorable Justice of the Peace Court Eulalio Chavez as acting dean and was replaced by Atty. Francisco G. Perez as its first Dean. The rapid increase in enrollment posed a big problem with regards to accommodation. In order to solve this problem, Provincial Board member Perez made some negotiations in order to lease a lot approximately 3290.76 square meters on M. H. Del Pilar from the government of Batangas Province for 99 years where the first one-storey wooden structure was constructed followed by the erection of a two-storey semi-permanent building. All classes then were transferred from the Javier residence to the M. H. Del Pilar campus. Due to public insistence, new courses were offered. Hence, it was necessary to construct another three- storey semi-permanent structure in 1950 to make the college accessible to all. At the time when the college was fast becoming popular, another founder Mayor Roman Perez was assassinated. Later on, after three years of service as President of WPC, Fr. Catapang resigned because of failing health but was succeeded by Mr. Javier. Later on, Atty. Umali retired from the college to spend more time with the law practice in his hometown Lipa. Fr. Catapang, as a president, is remembered as a disciplinarian. He was known for upholding quality education. His deeply rooted principles were manifested in the way he led the Western Philippine Colleges to its growth. It was said that the crowning glory of his presidency was the opening of the College of Law in 1949. The opening of the College of Law was not easy for the founders. It took a great deal of sacrifice on the part of Rev. Dr. Catapang and Mr. Javier before the college was established. For the school to be able to offer the course, both Fr. Catapang and Mr. Javier had to travel to far-flung towns of Batangas and Mindoro in order to market the course offering. Indeed, Fr. Catapang’s administration was likewise marked by an unprecedented rise of the school population. His passion for quality education had been made known to both the Batangueños and the Mindorenians; thereby leading to an increase in the number of enrollees. Fr. Catapang’s leadership also paved the way for the formation of student councils in the high school and in the then existing departments namely: Law, Liberal Arts, Commerce, Education, and Normal. The student councils were formed in order to train the students in politics and governance and in order to imbibe in them the principles of freedom and democracy as well as the responsibility to become a follower and/or a leader. As the enrollment and the number of graduates increased, the new administration under Mr. Juan Y. Javier was ready to face the challenges of a growing college. Thus, Mr. Javier’s term could boast of achievements like the founding of the school organ, “The Westernian Advocate” with Pedro S. Tolentino as the first Editor-in-Chief in 1950; organization of the student government as a venue for electoral practice; the ROTC all student brass band; the WPC Orchestra and other accomplishments that enhanced the confidence of the community on the usefulness of the college. The Western Philippine Colleges lost another pillar with the demise of Atty. Francisco G. Perez, who succumbed to a massive heart attack on August 20, 1959. But this did not prevent the remaining founders to surrender from their struggles. They were aware of their great responsibility to their community in the education of the youth as the hope of nation. The remaining founders moved on and made great strides for the development of the college. The fame and popularity of WPC spread to far-flung towns of Batangas due to the high rate of passers in the Bar and CPA examinations. For this matter, more and more enrollees flocked to Western Philippine Colleges. Year in and year out, famous lawyers, prominent CPAs, successful businessmen, as well as effective and efficient educators passed through the portals of WPC to which these men and women achievers had the “humble pride to belong.” Because of the influx of more enrollees, the administrators realized that more buildings had to be added. In their desire for growth, more courses were opened. However, this situation was marred by the sudden illness and the passing away of President Javier in 1964. Securities and Exchange Commission on December 23, 1967. The chairmanship of the Board of Trustees had been restored and was passed from Dr. Perez to Atty. Juan V. Ramos. Eventually, the position was handed to Atty. Vicente A. Mayo who held the position from June of 1973 up until his retirement in 2014. Dr. Abelardo lost the position of president to Mrs. Flordeliza Arguelles during the next election, thereby making Mrs. Arguelles as the fourth president. Eventually, Dr. Abelardo was once again elected as President of WPC in June of 1974. He held this position up to his untimely demise on April 18, 2007. His brother, the former Department of Justice Secretary, Dr. Hernando B. Perez, succeeded him. Dr. Nani was able to fulfill the dreams of Dr. Abelardo to lead the institution to greater heights. The Western Philippine Colleges continued to gain prominence in academic, cultural, research, sports and athletics, community extension services, national and international linkages, physical facilities development, and technological advancement. Through the years, WPC had gained prestige as it celebrated the 50th (Golden) Anniversary. It has passed Level I and II accreditation of the Liberal Arts, Education, and Commerce programs and with the change in status, from a college to a university. WPC was thereby named the University of Batangas, the first university in the Province of Batangas. UB in the 21st Century and Beyond Even before the start of the 21st century, the University of Batangas has metamorphosed from an unknown college in 1946 to a university in 1996. From the wooden and semi-permanent buildings on the M.H. Del Pilar campus, it had grown into several campuses. The once main campus on M. H. Del Pilar (Elementary Department) branched out to Hilltop Campus (the new main campus where the high school and college departments are located), Pallocan East campus (site of the Special Foundation and the UB Waldorf School International), Pallocan West (future site of the high school department), and soon to open Lipa City campus. WPC (now UB) had grown figuratively and literally from 48 students to an enrollment of almost 14,000 students housed in modern concrete edifices and equipped with computer-based facilities for quality education. Countless alumni have passed through the portals of their alma mater and had brought fame and glory to the university and the country and elsewhere as a fitting tribute to their beloved institution. The University of Batangas is a top performing school in the licensure examinations in Engineering, Education, Allied Medical Sciences, Business and Accountancy, Nursing and Midwifery, and Law. Examinees obtained scores way above the national passing score and at times garnered a 100% passing score in Civil, Electrical, Midwifery, and Physical Therapy Board Examinations. Success after success came. Five Level III and four Level II as well as a Deregulated Status has been granted by PACUCOA, AJA-JAS-ANZ ISO 9001:2008 Certified Status in 2009 and awarded by the Commission on Higher Education (CHED) a 3-year Autonomous status and the only Center of Excellence in Teacher Education in Batangas province in 2010. UB realizes the fact that education is an investment. Parents spend money in order to provide their children with the best education possible in order to prepare them for a better future. UB, in this regard, sees to it that the money spent shall not be wasted by ensuring the quality of education that it provides to the students. All the accrediting agencies see to it that the institution has obtained the following characteristics: 1.The school is devoted to its mission; 2. The school knows itself. It has thought deeply about the services it offers to students, family, and community; 3. The school is student oriented. Its philosophy of education is suitable for the students and encompasses the development of the whole individual; 4. The school keeps its promises. It promises only what it can deliver; 5. The school accepts objective assessment. It is prepared to open its doors periodically regular evaluation by the school community and by outside experienced evaluators; 6. The school is constantly seeking to improve its performance in curricular and other areas, with an ongoing focus on student learning and well-being; 7. The school plans for the future. As part of the ongoing nature of the evaluation process, accredited schools are continually planning future developments (Newsweek 26 April 2010, 54). With the status that UB has achieved, it only shows that the aforementioned characteristics have been observed and practiced. It gives an assurance to its clientele that it will continue to improve its learning outcomes so that it will become all the more capable of making the school a part of the people’s life. The UB community has been called by President Hernando B. Perez as the “University of the Future, the University of Choice.” With this battle cry more and more changes and projects were initiated such as the publication of the first book by the Batangas Heritage Center on the life and works of the first WPC President and one of the founders, Fr. Vicente Catapang written by Dr. Lino Dizon and the launching of the first Dr. Abelardo B. Perez Memorial Lecture. The onset of the 21st century brought about the opening of new linkages and reaching of new borders like the exchange programs with Korea and Japan; successful presentations of papers at the ASAIHL International Convention in Malaysia and other foreign countries where UB presenters excelled; partnership with SMART and other industries.